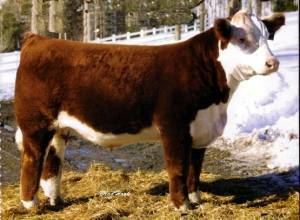 Hard Drive is a tremendous Online son who was named Reserve Calf Champion at the 2003 Western National Hereford Show at Reno. He is extremely smooth patterned and correct. Note his excellent front end and muscular hip.